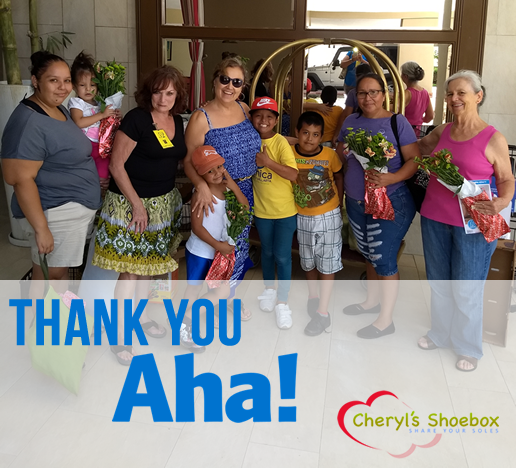 Home » Cheryl's Shoebox Blog » Thank You Aha! A huge thank you to the wonderful team at Aha! for your generous donation to Cheryl’s Shoebox. Aha! reached out to Cheryl’s Shoebox after our summer work of providing beds and linen for the families of children undergoing cancer treatment in Puerto Vallarta. The Aha! team donation was specifically made to help Cheryl’s Shoebox expand our assistance to more families under going these difficult treatments. With the help of Aha! and the continued support our community we are happy to extend our commitment to this cause. Thank You Aha! for your generosity and making a difference.